The most prominent Viking Wrestling prize in Norway is Norges Glima Mesterskap, the Løse-tak (Loose-Grip) Norwegian Glima Championship, organized by the Norwegian Glima Association. The 2018 Norwegian Glima Championship will be held on Saturday 15th December at Kolbotn Wrestling Centre. 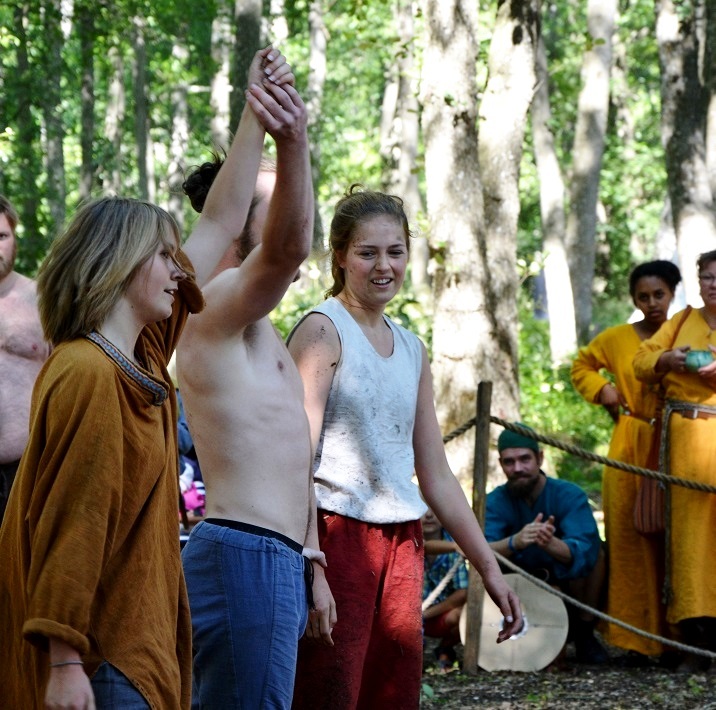 This sport glima championship comes from the ancient traditional folk wrestling from Norway and Scandinavia, which can be traced back to the Viking Age. Apart from dominating glima competitions at Viking Festivals, students of the Academy have won several Norwegian Glima Championships, Junior Norwegian Glima Championships, and Open Glima Championships. Academy students are training hard towards the 2018 championship. 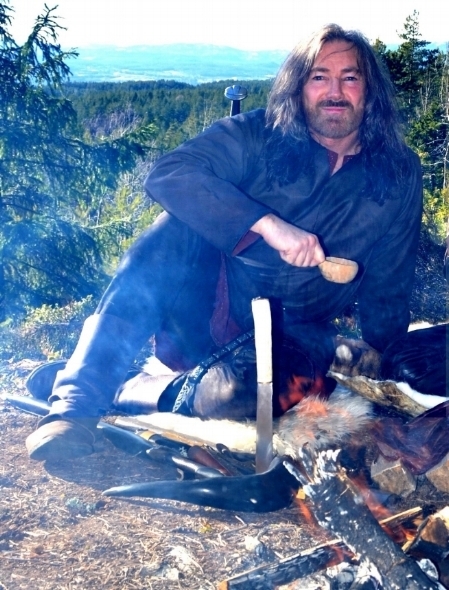 On the 19th of may 2018, Academy of Viking martial arts expert Tyr Neilsen, together with survival expert Håkon Thoresen, held a lecture about hunting, fishing and outdoors living techniques and equipment in the Viking Age and in the present day, at Eidsfoss estate, Vestfold County, in Norway. This was an exciting and educational lecture about a rarely discussed part of Viking history. This lecture was organized by Gammelt og Nytt (Old and New), which is one of Norway's leading specialty stores in knives, outdoor equipment and militaria. The premise was to look at how the Norse people in Viking Age Norway hunted, fished and survived out in nature, and compare it to how modern day Norwegians manage in these same fields. The origin of the word Viking comes from the Old Norse Víkingr. A ‘Viking’ was a part time farmer-hunter-warrior, who travelled to other lands and traded, raided, became sword for hire or conquered lands. These farmer-hunter-warriors were so successful in their part time profession in the late 8th to late 11th centuries that this period of history became known as the Viking Age. Over the centuries there has been an amazing amount of historical and archaeological research regarding the Norse people and Vikings. Everything from who they were, to what they conquered, when they conquered, and where they conquered. But very little academic research has been done regarding how they fought and why they fought the way they did. Yet these questions are of equal importance in understanding the Viking age as any other question. The answer lies in the hunting, martial art and survival skills of the Vikings. A lot has been written about the Viking Age, by poets, academics, and historians, but very little by warriors and hunters, yet warriors and hunters have a special insight into the creation of the Viking Age and what being a Viking really means. Tyr Neilsen is senior instructor for the Academy of Viking Martial Arts and the Norwegian Glima Association. Tyr started his training in the martial arts in 1973, and has trained armed and unarmed martial arts with the best experts in the world. In the last decades Tyr has taught the sport and combat forms of Viking martial arts in Norway, Europe and America, and has been in charge of Norway's Glima Championship since 2012. Tyr is very interested in what it means to be Viking and how it was to "Go a Víking". For a whole year in 2011, Tyr lived as a Viking, including traveling over 15 thousand miles, to 9 countries in Europe and Scandinavia to document the Viking Martial Arts, and how it is to live like a Viking. Tyr has also participated in many of the largest steel weapon re-enactments in Europe, including the Battle of Hastings, and is the only Norwegian to have taken part in the Viking/Slav battle in Wolin, Poland. Tyr has unique knowledge of viking history, culture, philosophy and mythology, and has held seminars at museums and schools in Europe and Scandinavia. He has been a consultant for several Norwegian related books, and has written the book Viking Wisdom - Håvamål - the Sayings of Odin, published in Norwegian and English. Håkon has been hunting since he was a boy. He thrives in all kinds of nature and always has a backpack, map and compass with him. In the late 1970s, Håkon was an instructor in winter survival for British forces in Western Norway. Courses always occurred in february, and Håkon was responsible for training the soldiers to ski, live out in winter, and survive in extreme winter conditions. From 1976 til 1996, Håkon held a series of courses in mountain survival for the department of defense. This course inlcuded all season survival, mountain rescue, climbing and maneauvers in ice conditions, and survival diet and nutrition. Håkon also contributed an article in a book about winter exercises for AMF forces (Allied Mobile Forces). Håkon's company, PSC, has held a series of courses, lectures and seminars on the themes: raising awareness, personality development, mastery and leadership. Håkon also arranges challenge training which clarify mechanisms associated with the mentioned themes. G & N was established in 1974 and has developed into one of Norway's leading specialty stores in knives, outdoor living and militaria. Because of the large interest in historical hunting and outdoor living, G & N has steadily had a selection of Viking equipment from knifes to swords. G & N is the main supplier to Viking groups in Buskerud and has had stands at many Viking markets over several years. In addition to hunting and outdoors equipment, the G & N store in Øvre Torggate 9, Drammen, has a huge selection of new as used weapons and hunting equipment. Viking wrestling competition at Norways biggest Viking market ! Academy of Viking Martial Arts Sport Glima instructor, Bjørn Braathen, is responsible for the Borre Glima Championship this year. Bjørn is 3 X Junior Norwegian Glima Champion (2013, 2014, 2015), -80kg Norwegian Glima Champion, and Gudvangen Glima Champion 2017. Borre Viking market is a fantastic arrangement. Highly authentic, with lots of traders, workshops, and entertainment, it's one of the best Viking markets in the world. Just as it was in the Viking Age, the glima competition will be held on a grass area, surrounded by an eager audience. This championship will have some of the best Viking wresters in Norway, as well as competitors from Europe. Congratulations to Oda Solbakken (15) on winning the women's division at the Borre Glima Championship. This was Oda's first competition, and she did the Academy proud, winning all her matches and showing Viking courage and determination. The finals for the 2017 glima championship were held at the Kolbotn wrestling house in Oslo. The championship attracted some of the best wresters in Norway, and competitors from as far away as Bergen fought for the gold in their weight class and the open title of Norwegian Glima Champion. By winning the open class, Adrian Jahre became Norwegian Glima Champion 2017. The Academy is especially proud of 18 year old Academy instructor in Sport Glima, Bjørn Braathen, on his winning the gold medal for his weight class, and for winning silver medal in the open class. A Norwegian Glima Association Viking Shield and bronze plaque, was presented to Kolbotn wrestling house in recognition for holding the championship there in 2016 and 2017. At the Gudvangen Glima Championship this summer, the Academy was represented by 18 year old Sport Glima instructor Bjørn Braathen. Instead of fighting in his weight division, Bjørn faught in the heaviest division and won every fight ! Although Bjørn weighs under 80 kg, he easily won every match in the over 80 kg Gudvangen Glima Championship, and won the overall title. The Norwegian Glima Championship 2016 was held in Kolbotn Wrestling House in Olso. Male and female competitors from Oslo, Bergen, Drammen and Hokksund fought in several weight divisions, then fought for the open weight category to become the undisputed Norwegian Glima Champion 2016. Congatulations to all glima athletes for a day of exciting and hard fought competition. Congratulations to medal winners and champions of the most prominent Viking Wrestling championship in Norway. Sebastian Aak, Norwegian Glima Champion 2016 Men - Pernille Rojahn Oddlien, Norwegian Glima Champion 2016 Women. The Academy of Viking Martial Arts has been integral in making Glima a recognised modern sport by working with the Norwegian Glima Association regarding the Norwegian Glima Championship which the NGA started in 2012. Sport glima - the ancient traditional folk wrestling from Norway and Scandinavia, can be traced back to the Viking Age. Through the work of the Academy, there has been weekly training in glima since 2009. This has led to a group of athletetes who have dominated this sport in Norway. Adrian Jahre, Norwegian Glima Champion 2017. Mats Rolfsen, Norwegian Glima Champion 2015. Bjørn Braathen, Junior Norwegian Glima Champion 2013, 2014, 2015. John Harald Foss Fjeldbu, Norwegian Glima Champion 2014. Andreas Sørensen, Norwegian Glima Champion 2012 and 2013.